Thanks for the very kind comment. I agree, this would make a nice first knife for a kid as it’s very simple. I agree Spyderco has released some cool stuff at the Amsterdam meet and I have been glued to Spydercollector’s site for the past few weeks checking out all the new stuff. I believe we will be recording a podcast on the subject in the not so distant future. 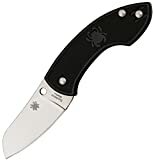 Spyderco is one of those fun companies that cater to those that want good production-grade tools despite silly local laws. I know that my Danish friends love them for this. The Pingo, while not my cup of tea, follows in this tradition. Good review, as always. Both designer’s being from Denmark I always wondered if they named this knife after our King-to-be who was a member of our frogman teams (Equivalent to the US ‘Navy SEALS’) He was nicknamed ‘Pingo’ by the team he was in.